There is a genuine pleasure in being able to bring the metalwork designs of past generations to life for the modern day. Typically, we are asked to do this work when replacing or reinstating iron railings, balusters and gates which have been damaged or lost to time. Recently, however, we had the opportunity to authentically recreate early 18th Century cast iron balusters for an entirely new residence. Situated within green belt land, the three-storey mansion had been designed in the Queen Anne Style. Throughout the construction, great care has been taken to ensure authenticity. This included the use of handmade bricks and tiles, reconstituted stonework and sliding sash windows of the correct proportions. There is even an original 18th-century fire mark on the front elevation of the home. Internally, traditional solid oak panelled doors and marble are combined with modern conveniences such as underfloor heating. At the heart of the home is a galleried entrance hallway which spans the full height of the property and is illuminated by a large roof light. 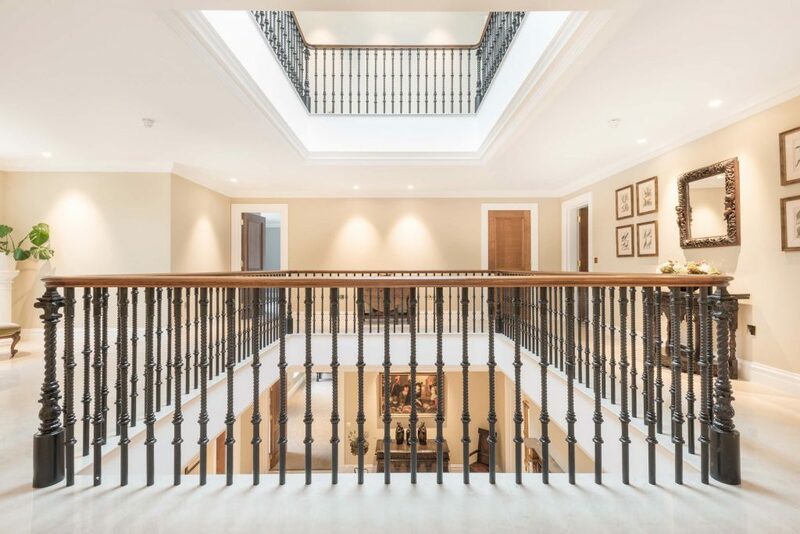 The homeowners approached us to provide British manufactured cast iron spindles and newel posts for the balustrading around these galleried areas, along with the balustrade required to the grand staircase that served the two upper floors. Working with the homeowners, we took considerable time selecting spindles and newel posts. 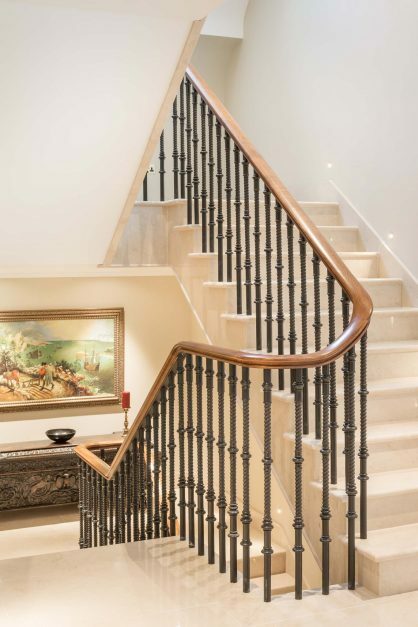 The staircase is visible from the moment that you enter the property and therefore need the exact same level of attention to detail as other statement pieces in the property. The key challenge was creating a design which matched the period and style that the client wanted, whilst also meeting all aspects of the Building Regulations. 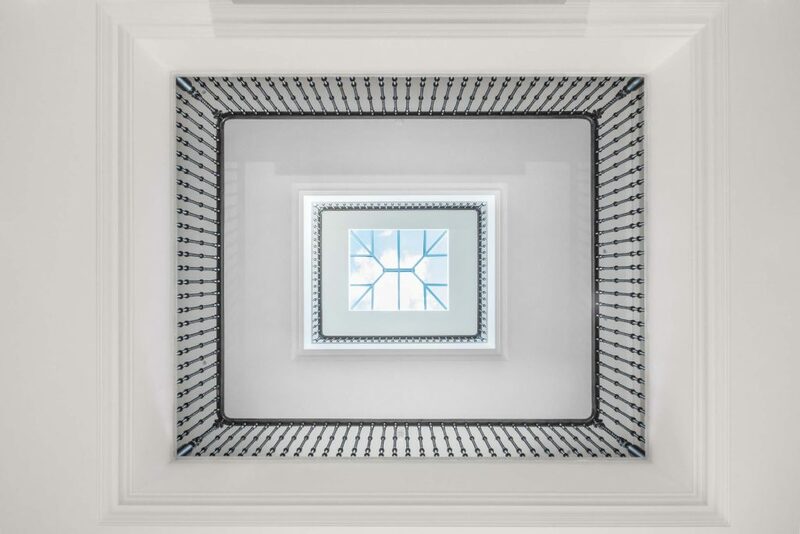 Initially the homeowners were looking to include decorative panels every third or fourth tread, however, this would’ve led to gaps greater than 100 mm at the top of the baluster making it non-compliant. 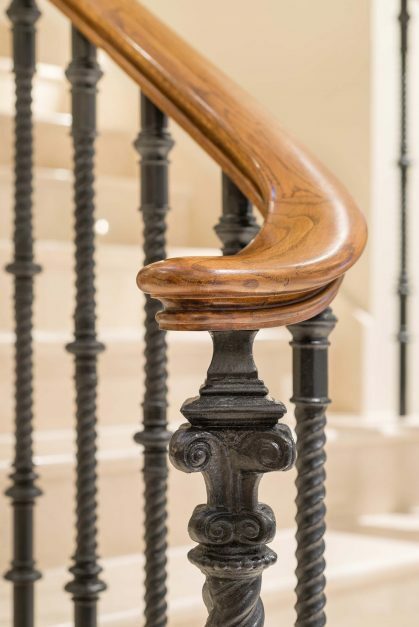 After discussing a number of alternative options, the owners selected a traditional twisted cast iron spindle and married this up with a more decorative, statement newel post. The newel posts sit at the corner of the each of the gallery sections and at the foot of the staircases meaning they had to be showcase features. 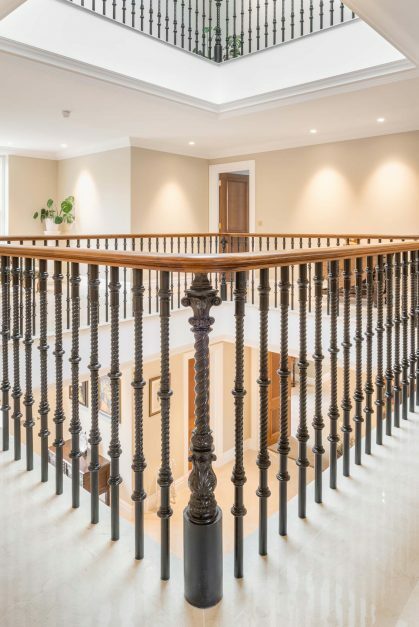 A core rail was fixed to the top of the balusters to secure them in place and to allow a bespoke oak handrail to fit on top which was crafted and created by Handrail Creations, who we recommended to the client as our partner of choice as we have worked with on many other projects. Floors throughout the entrance hall are finished in marble. We worked with the project stone masons to ensure that they knew exactly where the marble needed to be drilled, the hole size and depth of the holes. Our experienced specialist cast iron team triple checked every measurement to ensure the final balustrade sat perfectly. After a two-and-a-half-year build programme, the homeowners were finally able to move into the house in the autumn of 2018 and were delighted with the balusters saying the finished results look fantastic! We agree that it looks fantastic too and shows that visions can be achieved when bring the old to the new. Interested in a custom metalwork or a bespoke staircase or balcony for your own property? Take a look at our website, request a quote or — if you have any queries — get in touch via phone, email or by visiting our showroom here in beautiful Derbyshire.